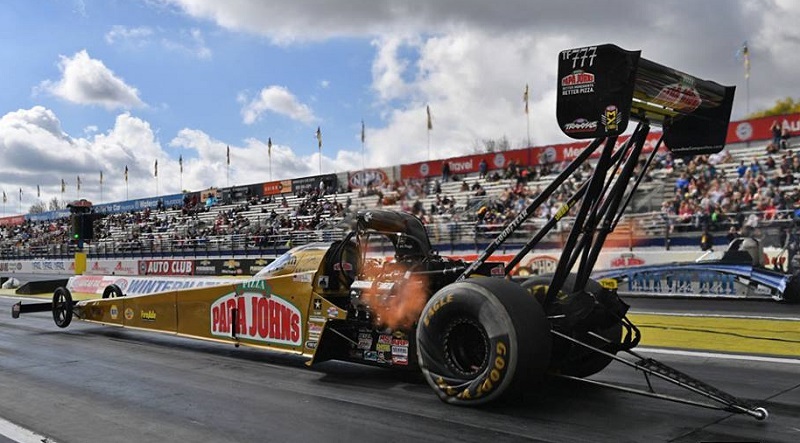 POMONA, Calif. — Leah Pritchett raced to her second career Top Fuel No. 1 qualifier at her home track Saturday at the 57th annual Circle K Winternationals. Pritchett, a Redlands, Calif. native, took her first pass down a dragstrip at the Auto Club Raceway at Pomona when she was eight-years-old in a Jr. Dragster. Qualified second and lining up against Steve Faria is Doug Kalitta, who ran a 3.686 at 329.58 in his Mac Tools dragster. Three-time world champion Antron Brown is third and will race Steve Chrisman. Hagan will line up against Jeff Diehl to start eliminations. Sixteen-time world champion John Force qualified second with a 3.849 at 335.15 in his PEAK Chevy Camaro, and will face Phil Burkart Jr.
Courtney Force is third and paired with Jim Campbell, while defending world champ Ron Capps is fourth and will race Bob Bode. Line will face Val Smeland in the first round of eliminations. His KB Racing teammate Greg Anderson qualified in the second position with a 6.530 at 211.66 and will race Kenny Delco, with Vincent Nobile qualifying third.